This "Historically Speaking" column appeared in the Exeter News-Letter on Friday, October 26, 2012. Among the research tools at the Exeter Historical Society are nine grey boxes filled with index cards. At one time, the cards were kept untidily in shoe boxes – different brands of shoes, different sized boxes. On the cards were one hundred years of the town’s history – indexed, alphabetized and referenced. If Nancy Merrill, the director of collections, needed to find information about the ‘Robinson Female Seminary,’ she knew exactly which box to check – it might be the Nike box or the Dexter box, but only Nancy knew which one. When a helpful staff member reassigned the cards to archival boxes with alphabetical labels, Nancy found that using them became more difficult for her. But by that time, even though her everyday memory was slipping, her grasp of Exeter’s history remained firm. As her family grew, Nancy kept herself busy doing historical and genealogical research, which necessitated hours of time in the local library. Nancy turned this into an avocation, studying for her Master’s Degree in Library Sciences and taking a job with the Exeter Public Library. By 1983, when the town was making preparations for its 350th anniversary, the selectmen knew that she was the person to spearhead the creation of an updated history of the town. Nancy began the project by taking on the monumental task of indexing the Exeter News-Letter from 1888-1988. Using the index, a committee would create the new book. In the dark and damp basement of the library, Nancy spent her time carefully reading each page of one hundred years of local news. Her children describe this period as a time when “supper discussions became exercises in time travel, as current events became interspersed with century-old news bulletins.” Each event was indexed onto a card with quotes and page references. She still organized her thoughts and notes like a nurse, using medical abbreviations and terminology (‘polio’ is indexed as ‘infantile paralysis’ and sometimes just ‘infantile’). When the book was finished in 1988, the committee voted to have Nancy’s name placed on the cover. She later told reporter, Terry Date; “that was the biggest tribute I could ever have.” The book has since sold out its initial printing. But apart from the book, the index has remained a vital source of information for researchers. I arrived at the Exeter Historical Society as curator in 2000 and encountered Nancy and the index at roughly the same time. She was no longer working as director of collections, but volunteered regularly and was more than willing to train me. Her memory problems were profoundly helpful to me, as she had a tendency to forget whether she’d told me a particular story before. Sometimes, she’d tell me the same thing three or four times in a single afternoon. This Suzuki style training imprinted my brain with Exeter’s rich history, and on those times when she described something unclearly, I could always go to the index to find the reference. It was usually there, although Nancy used her own filing system. The medical jargon wasn’t troublesome – my husband is a nurse, so I’m used to finding odd abbreviations on the supermarket list – but her nomenclature and subject headings could be challenging. We refer to the index as the ‘mixed-up files of Nancy Carnegie Merrill’ sometimes. She made the index for herself as a reference, after all, and told me that she’d never intended to save it after the project was done. Along with the News-Letter index, Nancy also kept files on Exeter topics. Inside each folder are pages of her research notes. Most of the time, one can just pick up where Nancy left off confident that if she’d already checked, say, the deeds, they were thoroughly checked. One mystery she never solved was the identity of Jolly Rand. The Jolly Rand Road was dedicated in 1980 as a scenic trail – but the question of how it got its name puzzled everyone. Nancy’s folder on the subject is a study in frustration as her notes list multiple people named ‘Rand’ but none that lived near where the trail is located (these are marked with a “NO” written in red pencil). Any time she had a spare moment, she’d go back to that folder, but she never uncovered who Jolly Rand was. I’m still searching for him. Nancy continued to volunteer at the historical society for years after her official retirement. Her insight was always valued – even if sometimes her memory failed her. Her index became a mystery for her, but not for the rest of us. 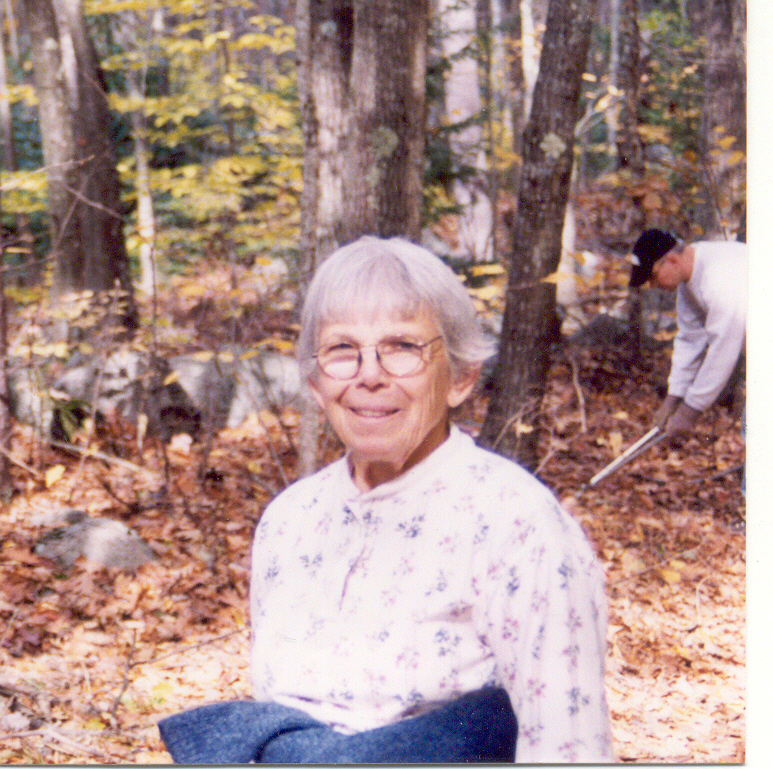 Nancy may no longer be physically here with us, but every day I am at the historical society I use her work. I touch her writing, read her words, hear her voice and marvel at her devotion to this town. We were lucky to have had her. 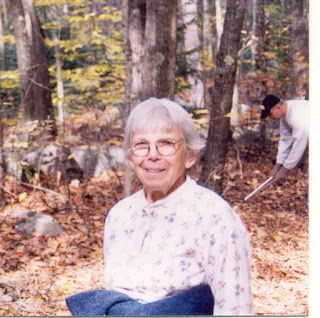 Photo: Nancy Carnegie Merrill in October of 1999 at the Jolly Rand Scenic Road clean-up day.